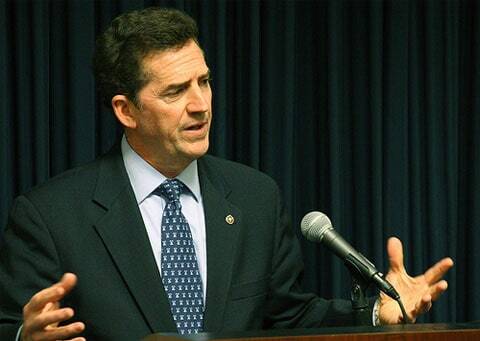 South Carolina Sen. Jim DeMint truly outdid himself over the weekend. DeMint, a Republican, has long railed against the gays, whose marriages he thinks are "destructive" to society. Well, DeMint went one step further this weekend, when, during a conservative church rally, he declared gay men and single women shouldn't teach, according to the Spartanburg Herald-Journal. "(When I said those things,) no one came to my defense,” he said. “But everyone would come to me and whisper that I shouldn't back down. They don't want government purging their rights and their freedom to religion." Huffington Post's Amanda Terkel points out that DeMint said something similar during the 2004 campaign and later retracted his statement, saying, "As my wife often reminds me, sometimes my heart disengages from my head and I say something I shouldn’t – and that’s what happened yesterday. I clearly said something as a dad that I just shouldn’t have said. And I apologize." Clearly DeMint's apologies aren't worth much, although one does begin to see why Senatorial hopeful Christine O'Donnell, who describes homosexuality as an "identity disorder," cited DeMint as her inspiration.